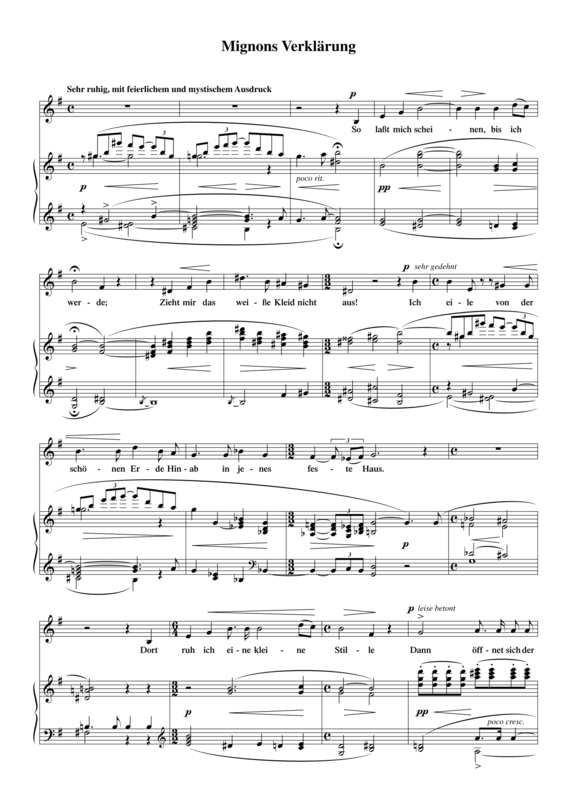 In the summer of 1886, two years after setting Goethe’s famous poem Mignon to music (RC 12), Diepenbrock turned to another poem from Wilhelm Meisters Lehrjahre (Wilhelm Meister’s Apprenticeship): Mignons Verklärung (Mignon’s Transfiguration), which is used a lot less frequently by composers. The song was never completed. It becomes clear from the only surviving autograph that Diepenbrock had problems with the composition and that, despite later revisions, he did not succeed in reaching a result that was good enough for performance. The song was published in 2001 in the Appendix of the Complete Songs for Solo Voice and Piano. Goethe uses the same first-person narrator in his poems Mignon and Mignons Verklärung. Above the score of Mignons Verklärung Diepenbrock has written a quote by Adolphe Julien: “Mignon, avec les ailes des anges, a pris aussi leur nature éthérée, leur voix séraphiques.” (Mignon, with angels’ wings, has also taken on their ethereal nature, their seraphic voices).1 When Mignon sings this song in Goethe’s novel, she is dressed as an angel, thus expressing her premonition of her approaching death. Like Mignon, the poem expresses yearning – though, no longer for the earthly but the heavenly paradise. Despite the rudimentary state in which this song has been transmitted, it contains interesting aspects which are characteristic of Diepenbrock’s early style period. The simple, strophic setup of the song and the largely diatonic vocal part do justice to an important aspect of Mignon’s character: her childlike innocence.2 However, as becomes apparent from Diepenbrock’s repeated attempts at revising the work, the composer had difficulty conveying Mignon’s premonition of her death. In order to express the mixed feelings, he once again used the half-diminished seventh chord which also plays a significant role in depicting the text in his setting of Mignon. The high register in the accompaniment refers to the ethereal atmosphere of Mignons Verklärung. Clearly, Diepenbrock’s later changes to the harmony, melody or rhythm were primarily aimed at perfecting the relation between the text and the music. A good example of this is the extra dimension given in a later sketch to the word “himmlische” (heavenly) in the first line of the third verse: a vocal line that drifts over the bar-line, independently of the metric accent. 1 A. Julien, Goethe et la musique (Paris 1880), 275. 2 See also F. Walker, Hugo Wolf (Graz 1953), 293.